We are in the ideal location for discovering the city's wonderful restaurants, shops, and attractions. 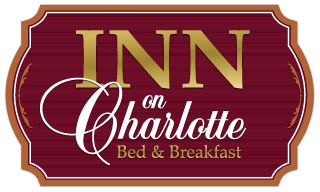 The Inn on Charlotte is one historic house away from the Matanzas bay front. And we are 1050 feet from the historic fort, Castillo de San Marcos and just 600 feet to the Bridge of Lions. If you are flying into Jacksonville (to our north 50 miles) or, Daytona (to our south 50 miles) or, St. Augustine/St. Johns County Airport (SGJ) (10 minutes) into St. Augustine, we suggest using an airport shuttle service. We do so because we are in a 'park-in and forget-it' location and you will not need a car (except to get to beaches). But rental cars are available at all these airports. Take A1A north from St Augustine Beach, as you cross the Bridge of Lions, take your second (immediate) right-turn onto Charlotte Street (just past the flag pole). We are on the second block, on your left. Some rooms park offsite so the room you booked has an assigned a parking space (Look at the full name of your room and see your emails to download a Map/Permit only if needed.) If you don't know where to park, or need to unload, pull into the bottom of driveway beside the Inn on Charlotte entrance, turn on your hazard flasher, and come ring the door bell. We will help you find your parking. Are you looking for Lot #8? From the Inn (52 Charlotte Street) continue going North on Charlotte Street, on the next block, the 6th building on left is a shop called 'Gabrielle's', turn left into the lot next to it. Park ONLY in your assigned space number and make sure your parking permit is left on your dashboard.